I’m sure most of you like to think that you are familiar with the term “pot committed”. However, I can guarantee that too many of you are using it as an excuse to make reckless calls, and it’s costing you dearly. On the other hand, if you’re not familiar with being “committed to the pot”, that’s cool. I’ll explain it in just a moment. In this article I will give a good (if I say so myself) explanation of what pot committed actually means. I’ll also go on to highlight the mistakes that too many players make as they convince themselves that being “pot committed” is a good excuse to throw lashings of healthy money in to bad situations. What does pot committed mean? You are pot committed when the pot odds for the remainder of your stack are greater than your odds of winning the hand. So instead of comparing the pot size to an opponent’s bet, compare the pot size to the remainder of your stack. If your "stack odds" are greater than your chance of winning the pot by the end of the hand, you are pot committed. Let’s say you and an opponent both started with $200 stacks. You are on the turn and you have built a $300 pot between the both of you, and so you’re both left with $50. If you have top pair at this point, you are virtually pot committed and should not fold at any point, whether it be on the turn or the river. You almost certainly have a better than 7 - 1 (12.5%) chance of winning the hand, even if your opponent usually only bets or calls with strong hands. In this example, our pot odds are greater than our odds of winning the hand. Therefore we are pot committed and should call. We’re not facing any bet, but if we look at our stack and pot size we can see that we are pretty much committed with a hand like top pair with 7 to 1 pot odds. Even though you really don’t feel as though you’re going to have the best hand most of the time, the odds indicate that you would lose more money over the long run if you folded. In fact, you would have to believe that you had less than 12.5% chance of winning to make a profitable fold (on the turn or river), which is highly unlikely in this situation. Being “pot committed” is simply working out your pot odds relative to the remainder of your stack (as opposed to working them out using the bet that you are facing). Working out whether or not you are “pot committed” just involves basic pot odds. The more of your stack that you invest in the pot, the greater your pot odds and the chances of becoming pot committed will be. This is why players are naturally more reluctant to fold after investing a large amount of money. You lose more money over the long run if you fold when pot committed as opposed to calling. Always call if you are pot committed. What being “pot committed” isn’t. An absolutely huge mistake that beginner players make is to throw good money after bad. The worst thing is that they use the term “pot committed” as an excuse to justify their play, and they fail realise just how abysmal their actions are. Can you see why that’s so wrong? Just because you have put the majority of your stack in the middle, it doesn’t make you “pot committed”. Commitment to the pot is about the odds of winning too, not just about the “majority of a stack”. Example of why you shouldn’t just look at how much you’ve invested alone. Let’s say that you’re on the river and you’ve put $999 of a $1,000 stack in to the pot. Just before your opponent bets his final $1, he shows you that he has a Royal Flush, beating your full house. He then bets that last $1. Should you call? Definitely not. You probably would just for a laugh, but you’re making a $1 loss every single time you call in that situation. There is a 0% chance of winning the $2,000 pot, but a 100% chance of losing $1. That leaves you with an EV of -$1. Having put $999 in to the pot makes no difference. In fact, you could have put $999,999 in the middle and it wouldn’t change the fact that calling that $1 is negative EV. You have to remember that the odds of winning help dictate whether or not you are pot committed, not just the amount of money you have invested in the pot. Your pot odds (relative to the size of your stack) must be greater than your chances of winning for you to be committed to the pot. How to use this “pot committed” knowledge during play. Avoid building big pots with hands that you’re not prepared to go all in with. Don’t assume that you’re pot committed just because you’ve put a wedge of your stack in to the pot. It may not be nice to fold, but it’s better than throwing more money away. You don’t have a sixth sense for knowing when you’re pot committed. Maths and odds are more reliable. Putting your opponent on a range and having reads will help you to figure out your odds of winning. A handy rule from Professional No-Limit Hold’em: Volume I is to never put 1/3 of your stack in the middle and then fold. The theory is that if you’re putting that much money in to the middle and then folding, you’re investing too much money with weak hands. Note: Why 1/3? Because if you have put 1/3 of your stack in the middle, it means that you or your opponent can make an all-in bet for the size of the pot or less. e.g. if you’ve put $34 of a $100 stack in the middle, the pot will be at least $68 and you will have $66 left - and so should your opponent. Don’t put 1/3 of your stack in the middle in the first place. If you have a good enough hand, don’t fold. Your odds of winning must be less than 2 to 1 (33%) to fold, so with a good hand you should be committed to the pot. If you don’t have a strong enough hand, you’ve made a mistake earlier on in the hand. You’ve either made bets that were too big or called large bets when it was probably best to have bet smaller, checked or folded. From the start of every hand you play you need to have a plan. You need to have an idea of how big you want (or dont want the pot to get). If you don’t plan effectively you will end up going past the 1/3 of your stack mark without much of an idea of what you want to do. If that happens, you’ll land in a sticky situation. There are a few exceptions to this rule, but this article is big enough already. Buy the book for a more thorough guide on the 1/3 rule or check out this commitment threshold article. Are you new to pot commitment or do you use it as an excuse? As I read through this article it seems as though I’m giving somewhat conflicting advice. On one hand I’m telling you not to use pot commitment as an excuse to throw chips in to the middle, but on the other I’m saying that you should never fold if you’re pot committed. If you’re new to pot odds and pot commitment, I want you to know that if you are indeed pot committed at any point, it is a mistake to fold. If you’re familiar with pot commitment and you’re using it too liberally, be prepared to think a little harder and don’t always allow yourself to be convinced that throwing the rest of your money in to the middle is the only option. Work out which group you fall in to and focus on the advice in this article that applies to you. If you’re in neither group, I hope you’re enjoying the article so far. If you are pot committed, do not fold. 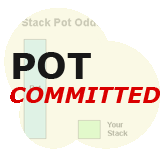 You are pot committed is when you have greater pot odds relative to the remainder of your stack than your odds of winning. Don’t use the term “pot committed” as a lame excuse to make bad bets and calls. Use the odds to determine whether or not you are committed to the pot and go from there. Don’t put 1/3 of your stack in the pot and then fold. Either don’t fold or don’t put that much money in the pot in the first place. Honestly, although the 1/3 of your stack rule is handy, I wouldn’t recommend spending too much time stressing about it. The most important lesson here is to plan your hands effectively. If you learn how to bet and call appropriately according to the strength of your hand, the 1/3 rule will take care of itself. Decisions that you make preflop and on the flop will affect what happens on the turn and river. If you fail to realise this very important point, you’ll end up in some very sticky situations and getting pot committed with cards that you’d never dream of going all-in with at the start of the hand. A good follow-on article to pot commitment is the article on Stack to Pot ratios.